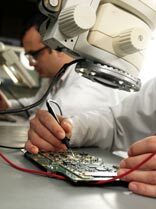 Are you in need of telecommunications equipment testing and repair? Modify existing equipment to improve performance. Our telecommunications equipment testing and repair services allow you to identify and correct problems that may have occurred in your telecommunication equipment and systems. It requires a thorough understanding of electronic equipment such as chips, circuit boards, software, hardware and processors used for the transmission, broadcasting, operation and control of telecommunications systems. Over the years Diversitec has developed an onsite, fully staffed lab that is used for testing the telecommunications equipment technologies we sell and support. And for those technologies we don’t sell or support, a network of leading service providers is available through Diversitec to meet your equipment service requirements. Contact us and you’ll get cost effective and timely service from our skilled staff and/or via our network of qualified telecom professionals.